On A Mission - Gabriella Cilmi: it's so good to have her back. A top electro-pop tune based around (what sounds to me like) the Joe Jackson 'Steppin' Out' bassline. Don't Wanna Lose You Again/Take You Home - A1: that's when I'm not supporting A1 of course!! And I still can't get enough of "Take You Home"...! Never Forget/Shine/Rule The World - Take That: you can tell that I've spent some time of late watching the Take That 'Circus Live' DVD: and why not. It's fabulous. Backseat - Staygold, Spank Rock and Damien Adore: 'get a job done in the parking lot....in the backseat of your car...."
Back to 1992, a year which I would be very happy to be stuck in with no escape (won't go into reasons why!!! :) ).....anyway the house-tastic "Movin'" by Marathon has been long overdue for the Retro Saturday treatment on EuropeCrazy so here it is, 18 years down the line.... still sounds very, very good. Back to the early 90s again - which was personally a very memorable time for me - here's a bit of Kym Sims (whatever happened to...?) who had a big hit with "Too Blind To See It" but I liked this one so much more - "Take My Advice" which had that distinctive early 90s house sound: "she got a smile on her face and a plan in her head" - good times, ooooh yes. Anyone for a bit of "Where Love Lives", then???? An early 90s dance classic which we will never tire of reviving. "Tune" indeed. Thought it was about time I resurrected the old Retro Saturday thing! Kicking off with something I loved from around 1994: apparently Dionne Farris was originally part of the Arrested Development crew, but I didn't know anything about her till "I Know" which got a lot of radio airplay around that time and this remains one of the great-lost-hits of the mid 90s. Enjoy! "Make My Day" - Maria Haukaas Storeng: it’s the law of diminishing returns I’m afraid. This isn’t as good as "Hold On Be Strong" and it’s not even as good as "Killing Me Tenderly" so I wouldn’t expect this one to win. "The Dragontower" - Keep of Kalessin: quite a daring choice and I wouldn’t write it off just yet. "Give It To Me" - Alexander Stenerud: I would really love to see Mr Stenerud get to represent Norge one of these days and they could do a lot worse than this.....very catchy, and I really like him and will be cheering him on next week. "Yes Man" - Bjorn Johan Muri: very contemporary and quite nice, although in a Eurovision defending-champion context, not too memorable. The annual NRJ Music Awards ceremony took place in Cannes on Saturday night. As I've been so busy lately and not had much time to blog or keep track of all things European and musical, it kind of passed me by this year and I even forgot to vote! Well done Christophe Willem, a well-deserved two awards for him. Glad that Sofia won best French female artist too. As I haven't paid too much attention to the French music scene over the last 12 months (with very few exceptions), the whole Mozart-thing has also passed me by, although I'm not surprised by its success if you bear in mind how well the likes of Cleopatre and Le Roi Soleil have done over the past few years. Yawn. 2009 was for me one of the poorest years for British music in a long time, so I guess this nominations list is a pretty accurate reflection of it I suppose, whereas in some previous years it wasn't. Probably the only redeeming feature is two nominations for Empire of the Sun, and a mention for Calvin Harris. As for that British single category...well it's like a British equivalent of musical torture at Guantanamo Bay. Only worse. Europe determines Melodifestivalen 2010 result???? 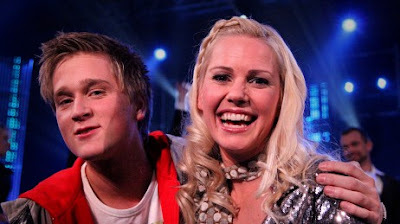 According to an article in Aftonbladet, http://www.aftonbladet.se/nojesbladet/article6438191.ab only five Swedish juries - located in Gothenburg, Malmo, Stockholm, Luleå and Umeå - will vote on the outcome of this year's Melodifestivalen final. Out go Örebro, Falun, Karlstad, Norrköping, Sundsvall and Växjö in favour of six juries from the European continent. MF project manager Thomas Hall claims that the six European juries will give a more accurate picture of what is musically popular in Europe - but I feel that this will dilute the unique geographical nature of what is the Swedish Song Contest after all. And just because some international juries were used in MF, it doesn't necessarily follow that the rest of Europe will equally appreciate the national winner when it gets to the Eurovision Song Contest stage. Oh well that's progress for you :( we'll need to wait and see if it's the right decision!! Årets album: Thåström: "Kärlek är för dom"
Årets låt: Mando Diao: "Dance with somebody"
Årets pop: Fibes, Oh Fibes! Årets barnalbum: Bröderna Lindgren: "Presenterar meningen med livet"
Årets specialutgåva: Olle Adolphson: "Tystnaden smyger som en katt... 1956–2004"
MTVs videopris: Timbuktu "Välj mej"
Particularly happy about Erik Hassle, Fibes, Oh Fibes! and Mando Diao winning; but disappointed (unsurprisingly) that Salem Al Fakir went away empty-handed. Still, there's always next year.....! Take You Home - A1: they have made a very nice transition from boyband to man-band. I really like this, it's a solid pop track which I'm playing a lot. Looking forward to them in MGP! Ambitions - Donkeyboy: still on a Norwegian theme, this remains a very addictive track and has been getting lots of play at EuropeCrazy HQ over the last 4 weeks. Morning After Dark - Timbaland featuring Nelly Furtado & SoShy: I'm surprised this didn't do better in our top 40 chart - it deserved better after all, when you think that autotuned rubbish like Iyaz can get to no.1 !! Appetite - Prefab Sprout: a true blast from the past, and a real classic. I don't know the reason why, but for some reason I want to listen to lots of Prefab Sprout again. And no autotune in sight. Over You - Erik Gronwall: these are good times for Chris Daughtry, as his songs are covered by Westlife ("What About Now") and this one, which appears on the debut album by the latest Swedish Idol winner. Very nice. And yes, I (finally) got into "Higher" too! Walking In Memphis - Calle Kristiansson: another cover version, this time by the Swedish Idol runner-up. Proof that you can't keep a good song down. Ten out of Ten - Paolo Nutini: this is such a catchy song! And don't be put off by the fact that it's currently in one of those DFS furniture commercials - it's a top tune. Great fun. Heaven or Hell - Osmo Ikonen: whether or not he'll win his Finnish national selection for Eurovision is irrelevant - but his musical talent is indisputable. This may not be as legendary as "Speakerbox" but it's still very good indeed. 4. Erik Linder - Hur kan jag tro på kärlek? Pauline has been named as the last 'joker' in the contest. Looking at that draw, would it be cynical (or realistic) to suggest that we'll be seeing Peter Jöback in Oslo? Only 4 weeks to go till the first semi-final (and yes, I am excited by the draw position of "Keep On Walking"!) and do you know something? I can't wait!!! Only the names have been changed...! Interesting to see that one of my all-time favourite reality pop contestants, Darius, is one of the contestants appearing in the new celeb-reality "Pop Star to Opera Star" show which is coming to ITV1 on Friday nights.